Hi Hayley fans! Hayley attended the Three Empire Awards earlier tonight in London (March 19). 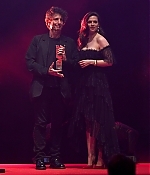 She looked absolutely gorgeous in Philosophy di Lorenzo Serafini as she stepped onstage with Neil Gaiman to present the Best Sci-Fi/Fantasy award to Juan Antonio for “A Monster Calls”. Head over to our gallery for more than 110 pictures of the event. Welcome to Hayley Atwell Web, your best resource for all things Hayley Atwell. She is best known as Peggy Carter in various films and television series set in the Marvel Cinematic Universe, including the ABC action-adventure series Agent Carter. Hayley will soon be seen in ABC's Conviction, as Hayes Morrison. We aim to provide you all the latest news, photos, in-depth information and much more relating to Hayley's career, and strive to remain 100% gossip-and-paparazzi-free. Check out the latest additions to our ever expanding gallery hosting over 36,000 photos! The social and class divisions in early 20th century England through the intersection of three families - the wealthy Wilcoxes, the gentle and idealistic Schlegels and the lower-middle class Basts. A brilliant young attorney, who is also the daughter of a former U.S. president, is blackmailed to head up LA's new Conviction Integrity Unit. She and her team investigate cases where people may have been wrongly convicted. Hayley Atwell Web is a website created by a fan, for the fans and is in no way affiliated with her management, or any company associated with him. All media, photos, trademarks and copyrights are owned by their respective companies. No copyright infringement is intended. Please contact us if anything should need to be removed from our servers. Paparazzi Policy: This website respects and maintains the privacy of Hayley and her life outside of her career and is therefore, paparazzi and gossip free. Unless they are pertinent to her career, you will not find them here.